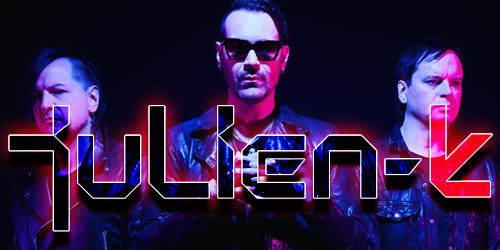 Having recently released the Time Capsule – A Future Retrospective four-disc set and hard at work on the upcoming album Harmonic Disruptor, Julien-K announces that the band will be touring the East Coast of the U.S. in July. The innovative electro/rock group will be performing as support for the Revolution 3 tour, which features a “tri-headlining” lineup of eminent alt. rock bands Bush and Stone Temple Pilots and U.K. hard rock/post-punk band The Cult. The tour spans 20 dates, launching in late July and running through early September; a full listing of tour dates can be found on the bands’ websites. Tickets for the tour go on sale through Live Nation on Friday, April 6. Julien-K had last toured the East Coast in summer of 2017 as the support act for PIG. Stone Temple Pilots is touring in support of a new self-titled album, the first with lead vocalist Jeff Gutt; previously, the band was fronted by Chester Bennington, best remembered as lead vocalist for Linkin Park and a longtime friend, brother, and band mate of Julien-K.